Behold the Virgin, the daughter of Adam and Mother of God; through Adam she gives her body to the earth, her soul to her Son above in the heavenly courts. Let the holy city be sanctified, and rejoice in eternal praise. Let angels precede the divine tabernacle on its passage, and prepare the tomb. Let the radiance of the spirit adorn it. Let sweet ointment be made ready and poured over the pure and undefiled body. Let a clear stream of grace flow from grace in its source. Let the earth be sanctified by contact with that body. Let the air rejoice at the Assumption. Let gentle breezes waft grace. Let all nature keep the feast of the Mother of God’s Assumption. […] Let us draw round that most sacred bed and sing the sweet words, “Hail, full of grace, the Lord is with thee. “Hail, predestined Mother of God. Hail, thou chosen one in the design of God from all eternity, most sacred hope of earth, resting-place of divine fire, holiest delight of the Spirit, fountain of living water, paradise of the tree of life, divine vine-branch, bringing forth soul-sustaining nectar and ambrosia. Come, let us stand round that pure tomb and draw grace to our hearts. Let us raise the ever-virginal body with spiritual arms, and go with her into the grave to die with her. Let us renounce our passions, and live with her in purity, listening to the divine canticles of angels in the heavenly courts. Let us go in adoring, and learn the wondrous mystery by which she is assumed to heaven, to be with her Son, higher than all the angelic choirs. […] This, O Mother of God, is my third sermon on thy departure…. Accept, then, my good-will, which is greater than my capacity, and give us salvation. Heal our passions, cure our diseases, help us out of our difficulties, make our lives peaceful, send us the illumination of the Spirit. Inflame us with the desire of thy Son. Render us pleasing to Him, so that we may enjoy happiness with Him, seeing thee resplendent with thy Son’s glory, rejoicing for ever, keeping feast in the Church with those who worthily celebrate Him who worked our salvation through thee, Christ the Son of God, and our God. To Him be glory and majesty, with the uncreated Father and the all-holy and life-giving Spirit, now and for ever, through the endless ages of eternity. Amen. John Damascene (c.675-749): Homily 3 on the Dormition of the Theotokos @ Medieval Sourcebook. He fulfilled the promise made to Abraham, which God had promised him, to make his seed as the stars of heaven. For this Christ did, who was born of the Virgin who was of Abraham’s seed, and constituted those who have faith in Him lights in the world, and by the same faith with Abraham justified the Gentiles. […] And He fulfilled the promise to David; for to him God had promised that of the fruit of his body He would raise up an eternal King, whose kingdom should have no end. […] Thus then He gloriously achieved our redemption, and fulfilled the promise of the fathers, and abolished the old disobedience. The Son of God became Son of David and Son of Abraham; perfecting and summing up this in Himself, that He might make us to possess life. The Word of God was made flesh by the dispensation of the Virgin, to abolish death and make man live. For we were imprisoned by sin, being born in sinfulness and living under death. But God the Father was very merciful: He sent His creative Word, who in coming to deliver us came to the very place and spot in which we had lost life, and brake the bonds of our fetters. And His light appeared and made the darkness of the prison disappear, and hallowed our birth and destroyed death, loosing those same fetters in which we were enchained. And He manifested |the resurrection Himself becoming the first-begotten of the dead (Rev. 1:5), and in Himself raising up man that was fallen, lifting him up far above the heaven to the right hand of the glory of the Father: even as God promised by the prophet, saying: And I will raise up the tabernacle of David that is fallen (Amos 9:2); that is, the flesh that was from David. And this our Lord Jesus Christ truly fulfilled, when He gloriously achieved our redemption, that He might truly raise us up, setting us free unto the Father. And if any man will not receive His birth from a virgin, how shall he receive His resurrection from the dead? For it is nothing wonderful and astonishing and extraordinary, if one who was not born rose from the dead: nay indeed we cannot speak of a resurrection of him who came unto being without birth. For one who is unborn and immortal, and has not undergone birth, will also not undergo death. For he who took not the beginning of man, how could he receive his end? Irenaeus of Lyons (2nd century AD – c. 202): Demonstration of the Apostolic Preaching, 35-38. With a blessed tongue, an unperturbed soul, and thoughts full of tranquillity she said: “Behold the handmaid of the Lord; be it unto me according to thy word” (Luke 1:38). These were the words that she said, and they were fulfilled at once: “And the Word was made flesh, and dwelt among us” (John 1:14). And, after giving her reply to God, she received the Spirit that created from her that flesh which was one with God. Her voice was a “mighty voice,” as David puts it (Psalm 67:34 [LXX]) and the Word of the Father isformed by the word of a mother, and the Creator is created by the voice of a creature. And just as when God said, “Let there be light,” “at once there was light” (Genesis 1:3), so, as soon as the Virgin spoke, the true Light dawned; and He Who “lighteth every man that cometh into the world” (John 1:9) was joined to the flesh and carried in the womb. O sacred voice! O words of great power! O blessed tongue, which restored the entire inhabited earth in one fell swoop! O treasury of a heart which, by a few words, poured out upon us an abundance of good things! These words made the earth Heaven, emptied Hades of its prisoners, caused Heaven to be inhabited by men, joined Angels with men, and formed the Heavenly and earthly races into a single chorus around Him who is both, being God but becoming man. What gratitude could we express to you for these words? What should we call you, of whom nothing human is worthy? Our words derive from existing things, whereas you surpass the whole world beyond every sublimity. If words are to be offered to you, this, I ween, is a task for Angels, for a Cherubic mind, for a fiery tongue. Hence, having mentioned, as far as we are able, those things which redound to your praise, and having chanted hymns to you, our salvation, to the best of our ability, we ask next for an Angelic voice. We will conclude with the salutation of Gabriel, adorning the sum of our oration with this additament: “Rejoice, thou who art full of Grace, the Lord is with thee” (Luke 1:28). May you prepare us to make a habitation for Him within ourselves, for this is conducive to His glory and to the laudation of you who gave birth to Him, when we not only talk about it, but also put it into practice, for unto Him belongs glory unto the ages. Amen. Nicholas Cabasilas (1319/1323–after 1391): On the Occasion of the Feast of the Annunciation, 9-10, Translated from the Greek text in “Homélies Mariales Byzantines (II),” ed. M. Jugie, in Patrologia Orientalis, Vol. XIX, pp. 484-495@ Old Calendar Orthodox Church of Greece. Our Lord took that same original formation as (His) entry into flesh, so that He might draw near and contend on behalf of the fathers, and conquer by Adam that which by Adam had stricken us down. Whence then is the substance of the first-formed (man)? From the Will and the Wisdom of God, and from the virgin earth. For God had not sent rain, the Scripture says, upon the earth, before man was made; and there was no man to till the earth (Gen. 2:5). From this, then, whilst it was still virgin, God took dust of the earth and formed the man, the beginning of mankind. So then the Lord, summing up afresh this man, took the same dispensation of entry into flesh, being born from the Virgin by the Will and the Wisdom of God; that He also should show forth the likeness of Adam’s entry into flesh, and there should be that which was written in the beginning, man after the image and likeness of God (Gen. 1:26). And just as through a disobedient virgin man was stricken down and fell into death, so through the Virgin who was obedient to the Word of God man was reanimated and received life. For the Lord came to seek again the sheep that was lost; and man it was that was lost: and for this cause there was not made some other formation, but in that same which had its descent from Adam He preserved the likeness of the (first) formation. For it was necessary that Adam should be summed up in Christ, that mortality might be swallowed up and overwhelmed by immortality; and Eve summed up in Mary, that a virgin should be a virgin’s intercessor, and by a virgin’s obedience undo and put away the disobedience of a virgin (1 Cor. 15:53). And the trespass which came by the tree was undone by the tree of obedience, when, hearkening unto God, the Son of man was nailed to the tree; thereby putting away the knowledge of evil and bringing in and establishing the knowledge of good: now evil it is to disobey God, even as hearkening unto God is good. And for this cause the Word spake by Isaiah the prophet, announcing beforehand that which was to come…. By him then spake the Word thus: I refuse not, nor gainsay: I gave my back to scourging, and my cheeks to smiting; and my face I turned not away from the shame of spitting (Isaiah 50:5). So then by the obedience wherewith He obeyed even unto death, (Phil. 2;8) hanging on the tree, He put away the old disobedience which was wrought in the tree. Irenaeus of Lyons (2nd century AD – c. 202): Demonstration of the Apostolic Preaching, 31-34.
nor did He choose her who was more suitable for Him than anyone else in the human race, but her who so totally suited Him, that it was fitting that she become His Mother. Indeed, it was absolutely necessary for human nature at some time to make itself fit for the task for which it was created at the beginning, that is, to bring forth someone capable of worthily serving the purpose of the Creator. For God did not create humanity with one purpose in mind, only to decide later on to use it for a different purpose, in the way that we take tools designed for one pursuit and misuse them for another, so that there is no need for them always to be congruent with their original function. Rather, He created mankind with this end in view, that, when He needed to be born, He might take from it a Mother. Having first established this need as a kind of standard, He then fashioned man in accordance with it. For, neither should we posit any other end for the creation of man than that which is the most excellent of all and which brings the greatest honor and glory to the Artificer, nor is it conceivable that God should in any way fail in creating the things that He creates. […] What, therefore, was there to prevent human nature from being in conformity, and in every way in agreement and harmony, with the purpose for which it was created? For it is God Who governs His Œconomy, and this Œconomy is the greatest work of God and par excellence the work of His hands; and He did not entrust the matter to the ministry of any human being or Angel, but reserved it for Himself. Therefore, whom, if not God, does it behoove, when producing anything whatsoever, to observe the requisite standards? And in the case of what else than the most beautiful of His works? On what else, of all things, if not on Himself, would God confer what is appropriate? After all, Paul required that a Bishop “rule well himself and his own house” before caring for the common good. Nicholas Cabasilas (1319/1323–after 1391): On the Occasion of the Feast of the Annunciation, 8, Translated from the Greek text in “Homélies Mariales Byzantines (II),” ed. M. Jugie, in Patrologia Orientalis, Vol. XIX, pp. 484-495 @ Old Calendar Orthodox Church of Greece. Elizabeth heard Mary’s greeting the child leapt in her womb, and she was filled with the Holy Spirit. Notice the contrast and the choice of words. Elizabeth is the first to hear Mary’s voice, but John is the first to be aware of grace. She hears with the ears of the body, but he leaps for joy at the meaning of the mystery. She is aware of Mary’s presence, but he is aware of the Lord’s: a woman aware of a woman’s presence, the forerunner aware of the pledge of our salvation. The women speak of the grace they have received while the children are active in secret, unfolding the mystery of love with the help of their mothers, who prophesy by the spirit of their sons. The child leaps I the womb; the mother is filled with the Holy Spirit, but not before her son. Once the son has been filled with the Holy Spirit, he fills his mother with the same Spirit. John leaps for joy, and the spirit of Mary rejoices in her turn. When John leaps for joy Elizabeth is filled with the Holy Spirit, but we know that though Mary’s spirit rejoices, she does not need to be filled with the Holy Spirit. Her son, who is beyond our understanding, is active in his mother in a way beyond our understanding. Elizabeth is filled with the Holly Spirit after conceiving John, while Mary is filled with the Holy Spirit before conceiving the Lord. Elizabeth says: Blessed are you because you have believed. Let Mary’s soul be in each of you to proclaim the greatness of the Lord. Let her spirit be in each to rejoice in the Lord. Christ has only one mother in the flesh, but we all bring forth Christ in faith. Every soul receives the Word of God if only it keeps chaste, remaining pure and free from sin, its modesty undefiled. The soul that succeeds in this proclaims the greatness of the Lord, just as Mary’s soul magnified the Lord and her spirit rejoiced in God her Savior. In another place we read: Magnify the Lord with me. The Lord is magnified, not because the human voice can add anything to God but because he is magnified within us. Christ is the image of God, and if the soul does what is right and holy, it magnifies that image of God, in whose likeness it was created and, in magnifying the image of God, the soul has a share in its greatness and is exalted. Ambrose of Milan (c. 337-397): Commentary on St Luke’s Gospel (Book. 2, 19.22-23. 26-27: CCL 14, 39-42) @ Crossroads Initiative. The angel of the Lord was sent to the holy Virgin, who was descended from David’s line (Luke 1:27). For it is evident that our Lord sprang out of Judah, of which tribe no one turned his attention to the altar (Hebrews 7:14), as the divine apostle said…. And bearing glad tidings to her, he said, Hail thou highly favoured one, the Lord is with thee (Luke 1:28). And she was troubled at his word, and the angel said to her, Fear not, Mary, for thou hast found favour with God, and shalt bring forth a Son and shalt call His name Jesus (Luke 1:3-31). For He shall save His people from their sins (Matt 1:21). Hence it comes that Jesus has the interpretation Saviour. The Holy Spirit shall come upon thee, and the power of the Highest shall overshadow thee. Therefore also that holy thing which shall be born of thee shall be called the Son of God (Luke 1:35). And she said to him, Behold the handmaid of the Lord: be it unto me according to Thy word (Luke 1:38). So then, after the assent of the holy Virgin, the Holy Spirit descended on her, according to the word of the Lord which the angel spoke, purifying her (Luke 1:27-28), and granting her power to receive the divinity of the Word, and likewise power to bring forth. And then was she overshadowed by the enhypostatic Wisdom and Power of the most high God, the Son of God Who is of like essence with the Father as of Divine seed. And from her holy and most pure blood He formed flesh animated with the spirit of reason and thought, the first-fruits of our compound nature – not by procreation but by creation through the Holy Spirit. […] Being by nature perfect God, He naturally became likewise perfect Man. He did not change His nature nor make the dispensation an empty show. He became, without confusion or change or division, one in hypostasis with the flesh, which was conceived of the holy Virgin, and animated with reason and thought, and had found existence in Him. He did not change the nature of His divinity into the essence of flesh, nor the essence of flesh into the nature of His divinity, and did not make one compound nature out of His divine nature and the human nature He had assumed. John Damascene (c.675-749): De Fide Orthodoxa 3,2 [slightly adapted]. The cataclysm of evil…was yet completely powerless against the blessed Virgin. […] Since that time had now come and the Angelic messenger was at hand, she believed, gave her consent, and undertook her ministry. These things were indispensable and in every way necessary for our salvation; without them, there would have been no hope for humanity. For, neither would it have been possible, had the Blessed Virgin not prepared herself, as I said, for God to look kindly on mankind and to desire to descend to earth, that is, had there not been someone to receive Him, someone capable of serving Him in the œconomy of salvation; nor would it have been possible, had she not believed and given her consent, for God’s will for us to have been realized. This is evident from the fact that Gabriel, in addressing the Virgin and calling her “Full of Grace,” expressed everything pertaining to the mystery. God did not descend until the Virgin sought to learn the manner of her conceiving. But when He saw that she was persuaded and that she accepted the invitation, the deed was accomplished straightway; and God clothed Himself in humanity and the Virgin became the Mother of her Creator. In the case of Adam, God neither foretold nor persuaded him concerning the rib from which Eve was to be fashioned, but put him to sleep, and in this way deprived him of the member in question; in the case of the Virgin, however, He first instructed her and awaited her assurance before proceeding to the deed. Regarding the creation of Adam, He conversed with His Only-Begotten Son, saying: “Let Us make man” (Gen. 1:26). But when, as Paul says, He was going to bring this wonderful Counselor (Isa. 9:6), the First-Begotten, into the world (Heb. 1:6), and to form the second Adam, He made the Virgin a participant in his decision. And this great counsel, about which Isaiah speaks, God proclaimed and the Virgin ratified. The Incarnation of the Word was the work not only of the Father, Whose good pleasure it was, and of His Power (1 Cor. 1:24), Who overshadowed, and of His Spirit, Who descended, but also of the will and faith of the Virgin. For, just as, without those Three, it would have been impossible for this decision to be implemented, so also, if the All-Pure One had not offered her will and faith, this design could not possibly have been brought to fruition. Nicholas Cabasilas (1319/1323–after 1391): On the Occasion of the Feast of the Annunciation, 3-4, Translated from the Greek text in “Homélies Mariales Byzantines (II),” ed. M. Jugie, in Patrologia Orientalis, Vol. XIX, pp. 484-495@ Old Calendar Orthodox Church of Greece. November 21st – The Presentation of the Blessed Virgin Mary / The Entrance of the Theotokos into the Temple. Since the Most Holy Virgin was brought into the temple to be instructed in the Lord, let us talk now about the benefit and necessity of going to the church of God as the house of God and place where we are raised for the Heavenly Fatherland. We are called Christians, and we are all called by Jesus Christ to the Heavenly Fatherland, to be heavenly citizens, Divine inheritors, co-inheritors with Christ. Our calling is very high, our duties are also just as important; our spirit should be very exalted, holy, meek, and humble. Who will show us what makes up our Christian calling and duty, of what spirit we must be, and how we should behave ourselves in various life situations? Who will give us the strength to live in the spirit of Christ—holy? The Church gives us all this. We can receive these spiritual powers in the temple of God through the Sacraments. Here a heavenly, unearthly spirit hovers; here is the school of Jesus Christ, in which future heavenly citizens are educated. Here you will receive heavenly lessons from the Divine Teacher, Jesus Christ, and the Holy Spirit in the Gospels. Here is heavenly food and heavenly drink, spiritual, heavenly garments, and spiritual armaments against the enemies of salvation. Here you will receive the peace that is a foretaste of heaven, so necessary to our spiritual activity and education, and strength for spiritual labors and struggle with sin. Here we partake of sweet conversation with our Heavenly Father and the Most Holy Queen and Mother of God, with the angels of the Lord and saints. Here we learn how to pray, and for what to pray. Here you will find examples of all the Christian virtues in the saints who are glorified each day by the Church. Here, gathered together in the house of God, as children of one Heavenly Father, as members of the mystical body of Christ, we learn how to love one another—member loving member, as members of Christ, as Christ Himself. See how beneficial, how necessary it is for a Christian to visit God’s church. It is a school of faith and piety founded by God, a sacred treasure According as His divine power hath given unto us all things that pertain unto life and godliness (2 Pet. 1:3), the treasury of all the Mysteries of Christ! John of Kronstadt (1829-1908; Russian Orthodox): The House of God – Homily on the Day of the Entry of the Most Holy Theotokos into the Temple @ Pravoslavie. for this we were cast out of the land of life and, in place of the delights of Paradise, we received temporal life as our inheritance by birth, and with it the death and corruption of our race. All started to prefer earth to heaven, so that there remained no hope for salvation, beyond the utmost help. Neither the natural nor the written law, nor the fiery reconciliative sayings of the prophets had power to heal the sickness. No one knew how to rectify human nature and by what means it would be most suitable to raise it up to its former worthiness, so long as God the author of all did not deign to reveal to us another arranged and newly-constituted world, where the pervasive form of the old poison of sin is annihilated, and granting us a wondrous, free and perfectly dispassionate life, through our re-creation in the baptism of divine birth. But how would this great and most glorious blessing be imparted to us, so in accord with the divine commands, if God were not to be manifest to us in the flesh, not subject to the laws of nature, nor deign to dwell with us in a manner known to Him? And how could all this be accomplished, if first there did not serve the mystery a pure and inviolate Virgin, Who contained the Uncontainable, in accord with the law, yet beyond the laws of nature? And could some other virgin have done this besides she alone, who was chosen before all others by the creator of nature? This Virgin is the Theotokos, Mary, the most glorious of God, from whose womb the Most Divine came forth in the flesh, and by whom He Himself arranged a wondrous temple for Himself. She conceived without seed and gave birth without corruption, since her Son was God, though also He was born in the flesh, without mingling and without travail. […] The Redeemer of the human race, as I said, willed to arrange a new birth and re-creation of mankind: just as the first creation, taking dust from the virginal and pure earth, where He formed the first Adam, so also now, having arranged His incarnation upon the earth, and so to speak, in place of dust He chooses out of all the creation this pure and immaculate Virgin and, having re-created mankind in His chosen one from among mankind, the creator of Adam is made the New Adam, in order to save the old. 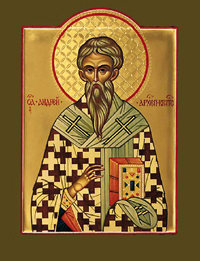 Andrew of Crete (c.650-740[? ]): Oration 1 – Homily on the Nativity of the Most Holy Mother of God; translation of complete homily @ St George Greek Orthodox Cathedral.